Post updated: See last paragraph in Curiosity section. After spending almost a month on the flats south of Murray Buttes, during which the rover drilled another hole, in the past week Curiosity has finally resumed its journey south toward the slopes of Mount Sharp and the sand dune area that it must cross to get there. Unfortunately, NASA has decided to change how it shows the rover’s progress, and these changes seem to me to be a clever and careful effort to make it more difficult for the public to make educated guesses about where the rover might be heading in the very near future. 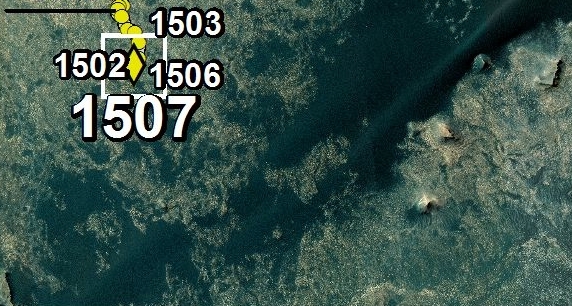 The image to the right is the cropped inset showing the rover’s recent travels that is part of a new a larger image that puts this inset in the context of the rover’s entire journey. This has replaced the wider orbital mosaic that they used to provide (see for example my September 27, 2016 rover update) that gave a very good view of the entire terrain surrounding the rover from which a reasonable estimate of its future path could be guessed. 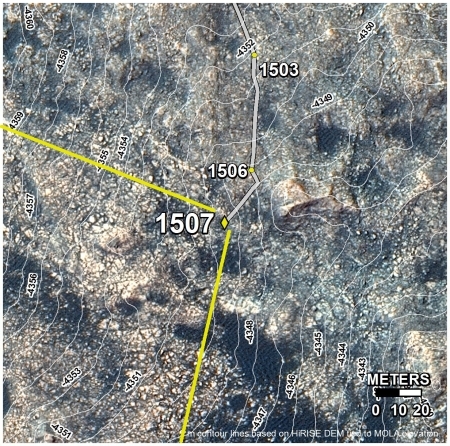 The new image not only doesn’t show much of the nearby geography, in the overall view the placement of text makes it impossible to get a clear view of the upcoming terrain. To the left is the specific section of this newly redesigned Curiosity location image that shows the rover’s position on the edge of this dune area. Unfortunately, the yellow diamond and the large “1507” text block a clear view of the sandy areas directly in front of the rover. Rather than study the rocks around them, they are going to focus their efforts in the coming days in plotting out the safest route through this sandy area. The direction of the panorama once again suggests to me that they will head to the southwest so that they can cut through the most obvious gap in the dunes, as shown in the overhead view. Below is the last orbital view using the wider mosaic that showed far better the context of Curiosity’s travels. 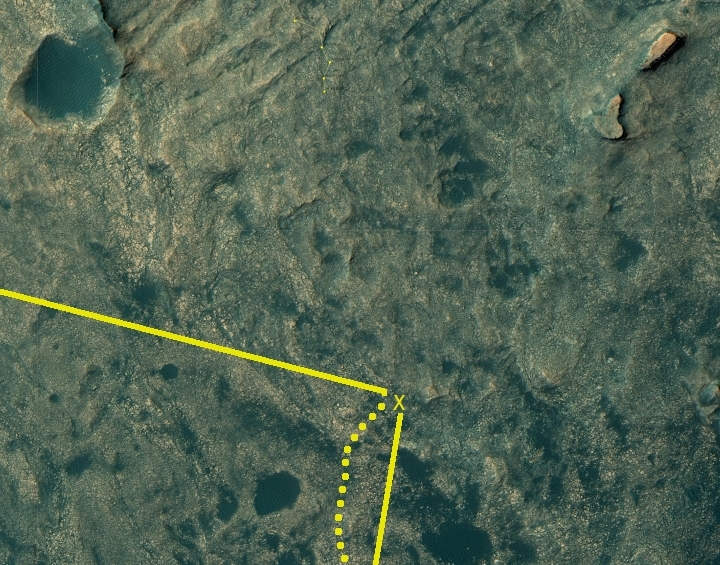 I have annotated it to show where the rover is now, and have indicated where I think it will be heading next. Update: I have no idea if my comments above had any influence, or if they were merely planning to switch back, but the Curiosity team that posts updates on the rover’s location today, November 3, 2016, abandoned the terribly uninformative orbital image I complained about above and went back to the earlier wider orbital images that show much more of the geography surrounding the rover. For this I am very grateful. Since my October 6, 2016 update, Opportunity has remained in the same spot, on top of Spirit Mound, during which they have taken a lot of pictures of this mound and its surface rocks, as well as the surrounding terrain. They are planning to back off the mound today, and will head south working their way inside the crater’s rim until they get to gully they intend to use to drop into the floor of Endeavour Crater. Yeah that newest Curiosity map looks like it was done by a kid. Very unprofessional.